DAMN it took me a long time to perfect this bread. I literally tested this recipe 8 times with various amounts of grain free flours, sweeteners, lemon juice, coconut oil (or no coconut oil), etc. Recipe testing isn’t always as easy as it looks. Often, it’s time consuming and often times frustrating. Yet I can’t complain, I love what I do and when recipes like this finally turn out beautifully, it becomes completely worth it. Spring always reminds me of lemon things. 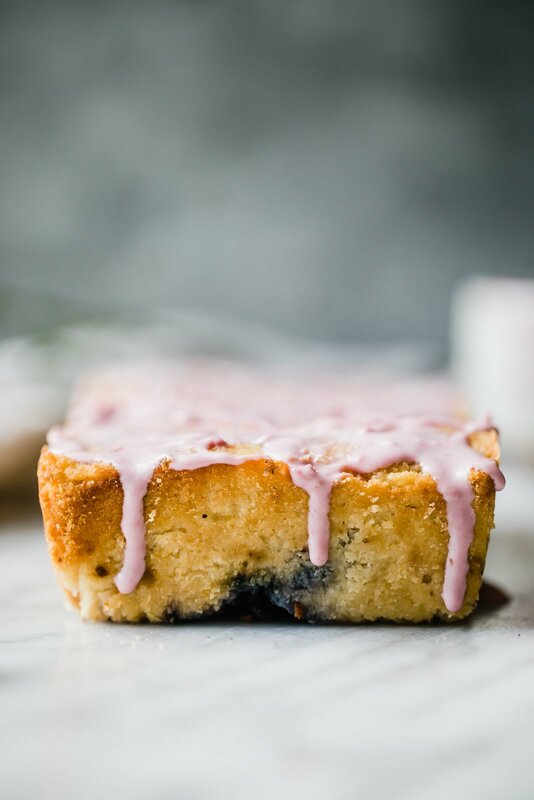 Because of the amount of requests I get for things made with almond and/or coconut flour, I decided to make a PALEO/GRAIN FREE/GLUTEN FREE/DAIRY FREE lemon blueberry bread for all of you. It’s light, perfectly sweet and ready for your oven. If you want you could add a tablespoon or two of poppyseeds to make it a lemon poppyseed loaf. Oh and we can’t forget about the glaze. It’s a mix of coconut milk (or you can use coconut butter! ), berry jam, lemon zest and lemon juice. It’s SO easy, yummy and PRETTY. If you want your bread extra cute, just add some crushed freeze dried raspberries and call it a day. Hope you love this lemon blueberry bread as much as my husband does. Fair warning: it’s addicting! 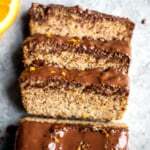 And if you do love it, then don’t forget to try my orange-kissed paleo loaf with dark chocolate. IT IS INCREDIBLE. Preheat oven to 350 degrees F. Line an 8x4 inch loaf pan with parchment paper or spray pan generously with nonstick cooking spray. In a large bowl, whisk together the dry ingredients: almond flour, coconut flour, baking soda and salt. In a separate large bowl, whisk together all wet ingredients: eggs, maple syrup, lemon juice, and lemon zest. Add dry ingredients to wet ingredients and mix well to combine. Lastly, fold in blueberries. Pour batter into prepared loaf pan and spread out evenly. Bake for 40-50 minutes until tester comes out clean. Allow loaf to cool completely in the pan before removing. Once loaf is cooled completely, make your glaze: Place a small pot over low heat and add coconut milk, lemon juice, jam and lemon zest. Stir constantly until ingredients are well-combined. 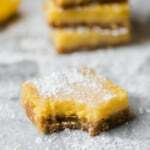 Drizzle glaze on top and garnish with zest from 1 lemon. Cut into 8 slices and enjoy! 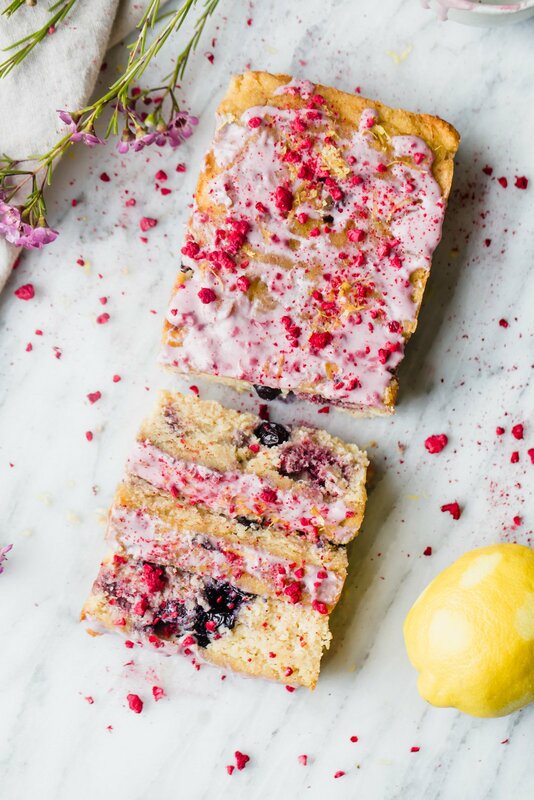 94 Responses to "Paleo Lemon Blueberry Bread"
This bread just screams SPRING! YES! All of the spring colors and flavors in here! Just made this bread for the first time. What a welcome item this is to our Paleo lifestyle. I love this with a cup of coffee! I’ve just made this!! Had all the ingredients on hand so why not. Quick question though, what did you have your oven on? Fan forced, not etc. Mine has come out flat and quite brown. Can frozen blueberries be used, instead of fresh? 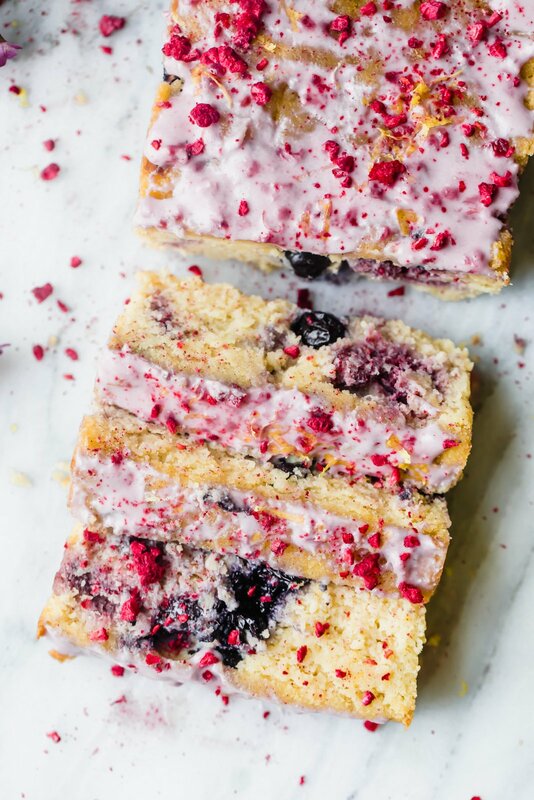 Whenever a recipe uses fresh berries I always use frozen, I just add to a bowl a little with of whatever flour I am using and toss the berries in it to help not turn the loaf blue or pink! Yes! See Emaleigh’s comment, too, on a tip for keeping them from dyeing the whole loaf. This looks absolutely amazing! I dont have coconut flour so I am going to try this with maybe 1/2 cup of oat flour in its place, I will let you know how it turns out! Thanks girl! Yes – let me know how the oat flour works out. oohh my gahhhh YES YES YES! I love how there’s only 1/4 cup of maple syrup in this recipe! I try to limit the amount of sweetener in recipes and sometimes have to go rogue, which doesn’t always turn out the best, so this is great how it’s already on the lower side! I think I’ll be making this this weekend….even better that I already have all of the ingredients. Absolutely! 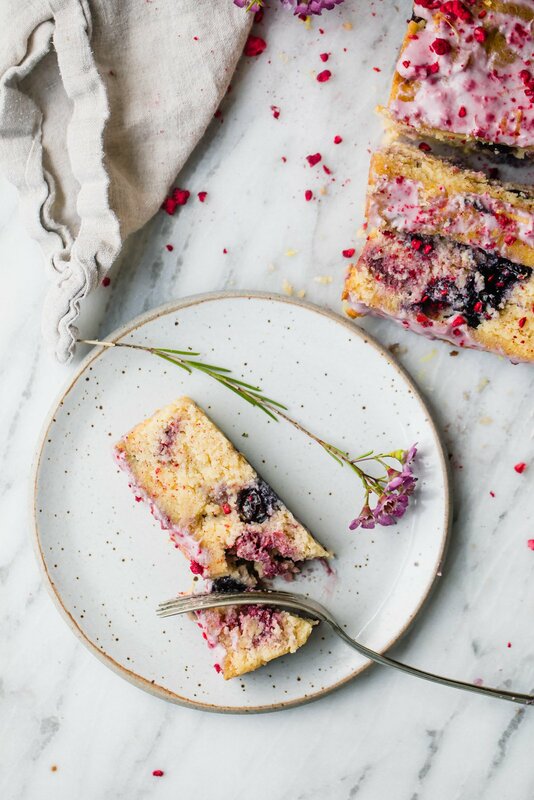 The almond + coconut flour add a bit of sweetness, and same with the bites of blueberries. Hope you love this one! SO pretty!! I think I’m addicted just looking at the pictures! It sounds amazing! Do u think I could sub the almond flour for oat flour or whole wheat? Thanks! I haven’t tried it that way, so I’m not 100% sure how the texture will hold up. If you try it let me know how it goes! Question: when you tried the recipe with coconut oil how much did you use? My ‘batter’ was closer to dough, and was so dry I had to spread it into the pan with a spatula – is that the consistency yours turned out to be? Very strange! This recipe was perfectly moist without using coconut oil, and the batter is on the thicker side (but still light). I think when I did test it with coconut oil I used about 2 tablespoons melted and then cooled, and mixed it in at the very end before putting it in the pan! I followed recipe completely and mine turned out super dry too. And it only took 35 minutes to cook. Any tips to make it more moist besides coconut oil? Delicious and I haven’t even put the glaze on it yet! Your recipes are some of the best tasting ones I’ve tried. Thanks for all your hard work and sharing. Just ate the last piece… made a double batch first time… one for hostess gift… one for home. LOVED it. Tasted better the 2nd day! Not cheap to get all of the organic ingredients but so worth it….the smell of coconut flour is amazing. Substituted a lil Forager Cashew Milk for coconut milk in glass… delish. Thnx so much! The perfect gift! So glad you loved this 🙂 and love that cashew milk too! Amazing! So happy to hear that Gloria! Any suggestions for flour substitutes for those unlucky people with an almond allergy? You could try using cashew flour or cashew meal! Any suggestions for egg substitutes? This looks amazing, but I have an egg allergy. 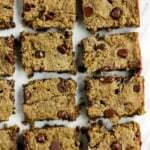 I haven’t tried to vegan-ize this, but you could try using flax eggs! I’m sure! When I tested it with about 2 tablespoons of coconut oil it ended up being too moist, especially the next day, which is why I opted for 3 eggs in this one. The batter should be thick but still light! What a great recipe! Made this yesterday for Easter and everyone loved it. Our two picky eaters even went back for a second slice. I will definitely be making this again. How would you recommend storing this? At room temp or in the fridge. I just made a loaf and am already anticipating breakfast!! Hi Cara! I’d recommend this in the fridge if you’re keeping it for a couple days (or longer) 🙂 Hope you’re loving this! In the past I haven’t had a whole lot of success with blueberries in paleo baked goods, but this bread turned out amazing! I was pleasantly surprised with how sweet the bread was with only a ¼ cup sweetener. I didn’t have any blanched almond flour, so I just used almond meal that I made in my blender. The bread was darker in color, but still tasted delicious and baked properly. This looks delicious! If I have a treenut allergy can I substitute using reg flour? I looove all of your recipes and tips, so had to try this one… but guess what… as soon as I put together wet ingredients with dry ingredients, baking soda reacted and made the batter full of air, is that normal? Mine didn’t come out as the picture, it doesn’t feels/looks like bread, is more crumbly…. what do you think it might happen? The batter will be pretty light (and not very “dense”) but it should bake up just fine! I would double check your wet to dry ingredient ratio, and also note that gluten free baked goods like this will have a different texture than traditional loaves because there’s no gluten. Thanks for sharing! Have you tried frozen blueberries? I like to bake with fresh ones but frozen should work! The color might just spread a bit. I cooked this recipe for my mom and she liked your recipe! Have you tried this with strawberries? Hi! I haven’t tried it with strawberries, but I bet it would be delicious! You shared a great recipe! Is there a difference between blanched almond flour and raw almond flour besides the way it looks in the end? Blanched almond flour just means that it has the skins removed before it’s ground, and it’s what I always use. I don’t think it would make a difference baking with raw almond flour besides the darker color, but I’m not 100% sure! Really excited to make this. do you think I could use all coconut flour? Hi, I’ve never used coconut milk, in the ingredients you say “coconut milk from the can, just the top, solid part”, what does this mean? I just want to make sure I get the right ingredient the first time around. Thanks! Exactly my question! I’m making this today but I don’t understand the just top solid part! I made this over the weekend and it was absolutely DIVINE. perfectly moist, great crumb, great flavour, just the right amount of sweetness. I omitted the glaze as didnt have coconut milk on hand. Amazing! Glad you loved it. Just as delicious without the glaze! 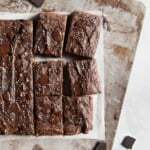 Can I use all purpose flour in place of coconut and almond flour? Thanks. I wouldn’t recommend it! The ratios will be very different. My family doesn’t like the taste of coconut milk. Is there something I could replace it with in the glaze? 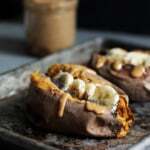 I made this without the glaze and it was so delicious! I subbed honey for maple syrup and it worked well. Super moist and flavorful. Hard to have just one slice 😬. Thank you! Delicious even without the glaze! 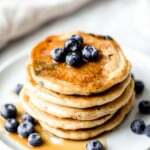 Is there a good substitute for coconut flour? 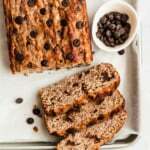 My son has a coconut allergy, but I would love to make this bread! Oat flour should work, but please know I haven’t tested it this way. Do you think it would hold up well if it was frozen? I’m trying to make some loafs for meal prep. Don’t really know what I did weight but it appears the centre of the loaf didn’t bake the same as the rest of it? It has a downward curve to it. I’m sorry you had trouble. I haven’t had this problem. Did the tester come out clean? Sometimes this is just how grain free breads are.